This collection of rare and vintage computers is one of the largest collections of historical computers in the United States. The EarlyComputers' collection is intended to foster education, encourage research and preserve items that are an integral part of computer history. Our goal is to provide a wide array of rare materials (hardware, software, magazines, newsletters, peripheral devices, books, advertisements, games and personal recollections) that can be used to obtain a broader and better understanding of the history of computing. The collection houses over 1,000 vintage computer related items, including more than 180 vintage computers and over 20 analog computers. The collection of hardware, software and print materials consists of a wide variety of rare computer items ranging from an 1834 article about Charles Babbage's "new Calculating Engine" to a 45 rpm blue, vinyl record used to store computer programs to numerous computers manufactured between 1950 and 1981. The EarlyComputers website is attempting to provide you with original research using primary source materials whenever possible. Aside from making use of the rare computers in the EarlyComputer's collection, we are also making use of the Smithsonian, the National Archives, numerous other collections (such as Bruce Damer's DigiBarn collection) and personal interviews with individuals who were involved in bringing about the personal computer revolution. What's in the EarlyComputers Collection? We house a very large collection of rare computer documents related to the history of computing. These include documents from early as 1834 (Charles Babbage's Difference Engine), 1889 (the Electric Tabulating System), 1948 (Shannon's Mathematical Theory of Communication), 1949 (Shannon's Communication Theory of Secrecy Systems), 1965 (Gordon Moore's article in which he posits the now famous "Moore's Law") and many others up to 1981. Another focus of the collection is on contemporary print material ranging from computer magazines (such as the People's Computer Company, Byte and the Silicon Gulph Gazette) to company catalogs and brochures to mimeographed newsletters such as the Computer Notes (Altair), the Viper (Cosmac VIP) and Ipso Facto. In addition, the collection houses the largest collection of analog computers in North America and includes analog computers from companies such as Electronic Associates Inc., Welch, Donner Scientific and AMF among others. 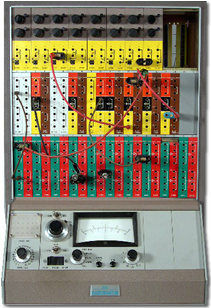 The collection includes several extremely rare analog computers such as the Pastoriza Personal Analog computer, a pre-WWII US Navy fire control analog computer and the Lan-Electronics Analogue Computer (the English spelling). We also have a large number of rare computer documents and objects related to Herman Hollerith who is the first person to use electricity in tabulating data. His Electric Tabulating Machine is one of the foundations of modern computing and it clearly demonstrated that electrical computing would be significantly more efficient than any other known method. Hollerith is also credited with developing the modern punch card system of storing and sorting data (what many of us now call IBM cards). What is a "Vintage Computer"? There are many definitions of what an "early" computer really is. Some say a computer made more than 20 years ago is historical, others argue that a truly vintage computer must be 25 years or even 30 years. The trouble with choosing a timespan like "25 years ago" is that it changes as each year goes by. We choose to pick a significant date in the history of personal computing. We define early computers as those made before IBM entered the personal computer market in 19811. IBM's entrance into personal computing changed the face of the industry. With IBM's knowledge, marketing and world-wide presence, it instantly became the 800 pound gorilla and not many companies survived. Therefore, our collection is generally limited to items manufactured or printed ON or BEFORE 1981. As we develop the earlycomputers.com website, we hope to give you the opportunity to participate directly online.... the chance to add your stories, your research and your experience to ours. In the meantime, if you are interested in participating, please contact us at help@earlycomputers.com. many small computer companies that could not compete with IBM. Copyright © 2017 by Early Computers Project, All Rights Reserved. Mark 1A Fire Control Computer, ElectroMechanical Analog Computer, 1945?